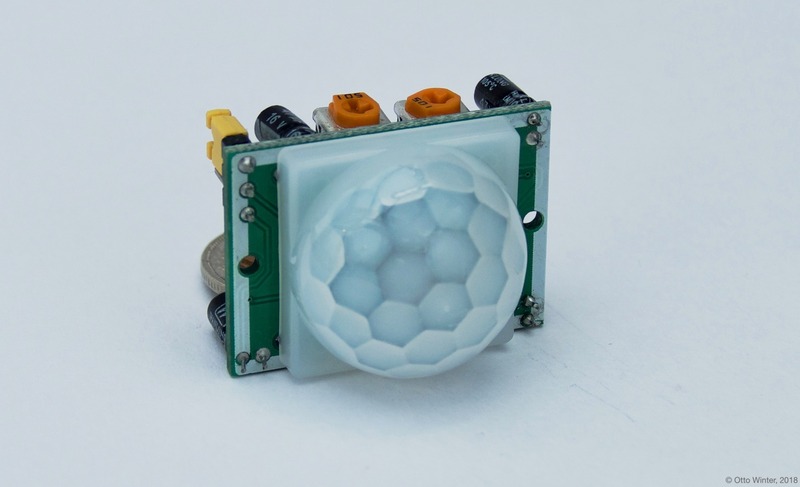 Passive Infrared Sensors (or PIR sensors for short) are completely supported by ESPHome. These sensors measure the infrared light emitted from objects in its field of view, and if it detects a sudden change between different parts of the sensing area, the signal is pulled high. Connecting the PIR sensor is also quite simple. 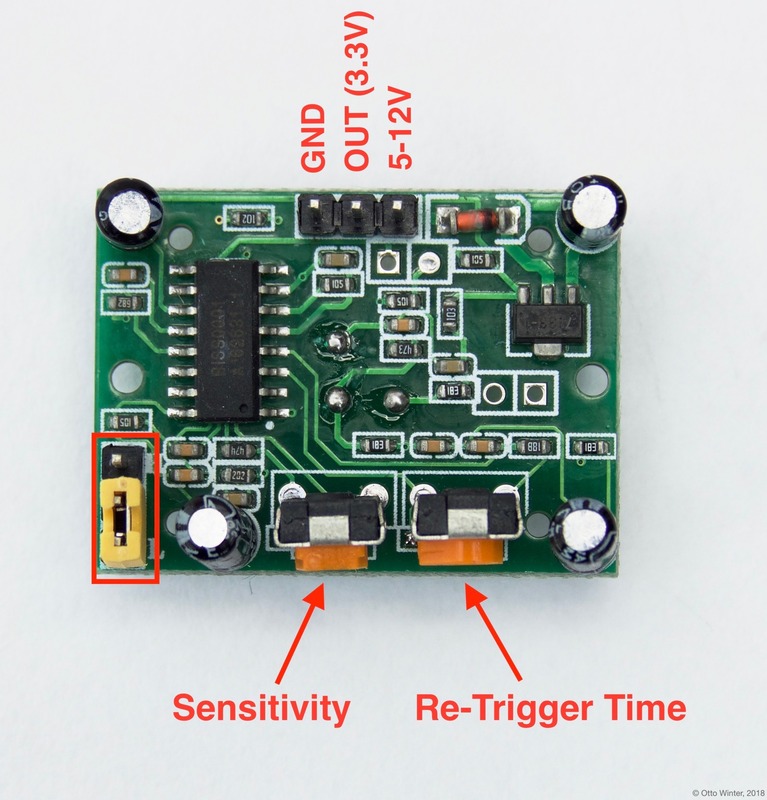 You need to connect GND to a GND pin on your board and VCC to a 5V or 12V pin. 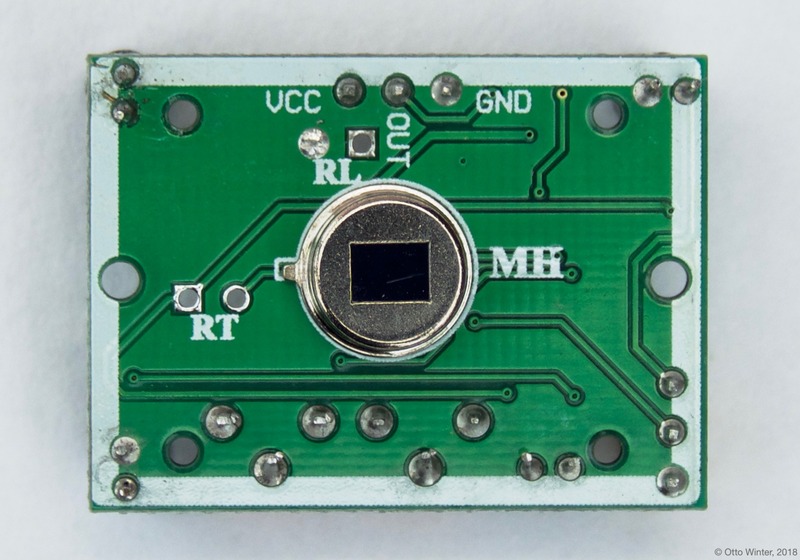 Technically you can also connect VCC to 3.3V, but the sensor measurements won’t be as stable. Next you need to connect the signal pin (OUT). Fortunately, the sensor signal has a voltage of 3.3V max, so we can directly connect it to a free GPIO pin on the ESP board. Otherwise, we would need to step down the voltage in order to not damage the ESP. Some PIR sensors have the GND and power supply pins swapped, please open the front cover to see which pin mapping your PIR sensor is using to make sure. On the back side you will additionally find two knobs that you can turn to change the sensor sensitivity and time the signal will stay active for once motion has been detected. Turning these clockwise will increase sensitivity/re-trigger time. To configure ESPHome for use with the PIR sensor, use a GPIO Binary Sensor. It can detect if a pin is pulled HIGH/LOW and reports those values to Home Assistant. Optionally also set a device_class so that Home Assistant uses a nice icon for the binary sensor. Awesome article explaining how PIR Sensors work.